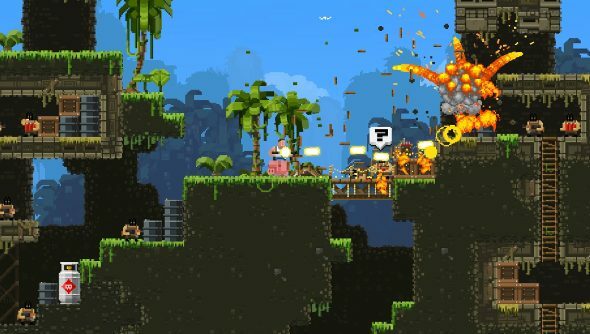 Action movie obsessed Broforce has been fun and playable for a good long time and has even been the source of a free licensed Expendables game, but that whole time, it was in Early Access. No more, as it has freed itself and is now frolicing around the open plains of Steam. Broforce puts you in the tough shoes of members of a special paramilitary organisation, and all of them happen to be action heroes from the ‘80s and ‘90s, from a John McClane knock off to a chap who bears a striking resemblance to Robocop. The goal of each mission is, generally, to make lots of lovely explosions while slaughtering hordes of enemies in the game’s fully destructible environments. You’ll also be able to play co-op, fight fellow action heroes in deathmatches, leg it through timed levels where everything is blowing up and make your own levels in the editor. For the next week, Broforce is 33% off on Steam, Humble and other digital shops.